Maidens of Worth: Remember to Enjoy God's Creation! The weather is beautiful right now, and I am praising God for the opportunity to enjoy His creation. It still gets rather hot in the afternoons, but the other times of day are usually pretty pleasant, especially when a gentle breeze blows by. There have been frequent rain showers, and I've gotten wet through (an umbrella doesn't do much good when the rain blows sideways! ), but even then I see God's majesty in the storms. I get plenty of opportunity to savor the beauty God has made each day, as I walk to classes, the cafeteria, and wherever else I may have to go. I enjoy the walks, for it gives me great exercise after sitting in classes, and the chance to savor the quiet and thank God for the day, or talk with others as we go to or from class. There are also speakers placed throughout the above walkway that pipe out classical music continuously. Someone aptly named the round, green speakers, "the singing mushrooms." 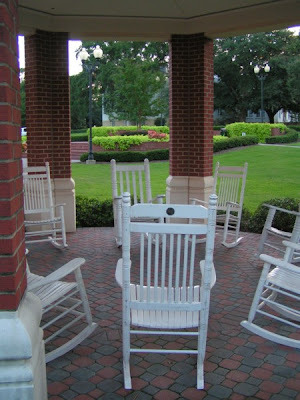 =) The music is pretty and relaxing as you walk by or enjoy sitting beneath the magnificent trees. 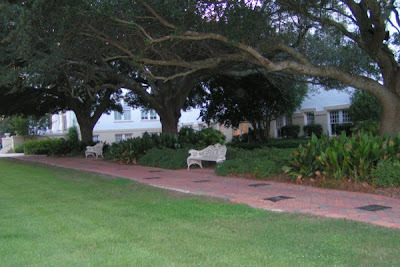 The Belhaven Campus is very beautiful, and I am blessed to be able to enjoy it. 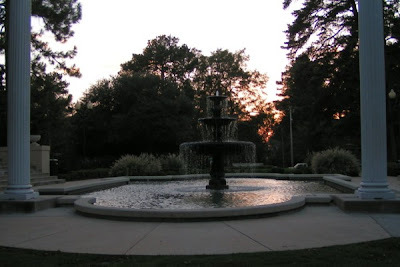 There is a fountain outside of the cafeteria, a pavilion-type place with fountains shooting out of the pavement, and fountains in the lake outside my dorm. It's lovely to see and hear the water at different times of the day! 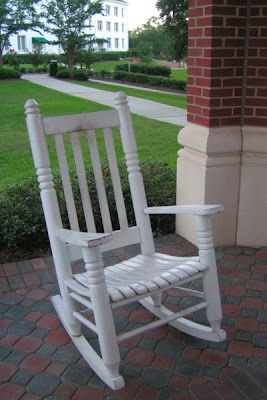 My favorite place to sit and do homework or write letters are the rocking chairs outside of the student center. It's a much more pleasant atmosphere to work in, for I get "cabin fever" if I stay inside the dorm room too long. The background noise is perfect - water splashing from the fountains, birds singing, and gentle breezes blowing by. Though it can sometimes be more distracting as people walk by, for the most part it is quiet and easy to study, and the cheerful "hellos" from friends as they walk by are encouraging. So what are you doing to enjoy God's creation? Don't stay inside all day - get out and enjoy it! Even if it's just sitting still and working on other things, the outside atmosphere can make the work a lot more enjoyable. And in all you do, remember to praise God for the amazing things He has done and continues to do in our world. How funny that you should write this today! I spent several hours outdoors this morning and afternoon, exploring the mountains and ridges. I intended to go for a quick forty-minute walk, but the world was so truly beautiful that I couldn't bring myself to go indoors. Looks like a beautiful campus:) I used to enjoy painting by a lake at Troy State back...mm..12 years ago. Well, I was outdoors from around 5 pm until almost 10 pm. We packed a picnic supper and went to Broadway Under the Stars on the grounds of the Alabama Shakespeare Festival. This is a free annual outdoor concert performed by the Montgomery Symphony Orchestra. It was hot until around 6:30 pm, when the sun went down. Around 8 pm a lovely breeze began to blow. It pretty much kept up throughout the concert. Ahh... delightful... could it be the first teeny,tiny hint of autumn?! Here's hoping! Belhaven looks lovely. I guess it is because of how green it is. Our college here isn't as lovely (since we are mostly desert) but it does back up to the Boise River, which does have trees. It is lovely....but in a different way! Mamselle Clare Duroc: Your walk sounds like fun! The outdoors truly are beautiful this time of year. Maria: Yes, it is a blessing to be surrounded by such a beautiful atmosphere. Mrs. Hart: The concert sounds like fun! Which I could have been there, but I'm glad you enjoyed it. Ella: Yes, the green is so nice! I talk it for granted far too often. I notice just how green it is when I look back at the pictures!